I love photo trips that produce a number of quality images and this trip to Escalante Grand Staircase was quite fruitful. Willie and I explored a number of slot canyons, played amongst gigantic hoodoo rock sculptures, and practically repelled into gorgeous red rock river canyons. We found this pool of water whilst walking through Coyote Gulch Canyon. 300 foot red rock walls surrounded us as we walked through the river in search of waterfalls and autumn color. Shortly after photographing a stunning waterfall we came upon this pool of water with decaying leaves in it. As the leaves die they leak oils into the water. 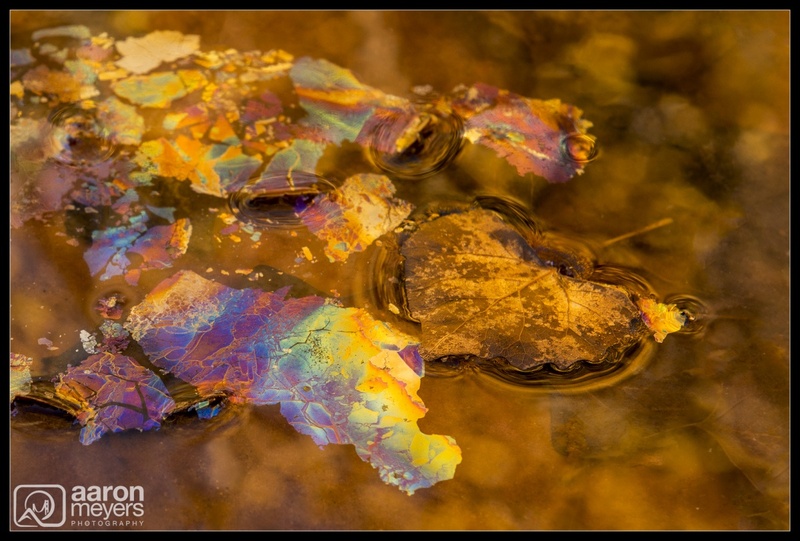 Light reflects and refracts off the oils, causing the wavelength of light to change and giving this puddle the multi-colored spectrum you see here. I walked around until the yellow leaves from the tree above were reflected in the puddle. From a different angle the entire pool looked blue but I loved how the yellow water matched the yellow leaves.